A new version of Digg is in the works, and it brings significant changes for Power Users and Publishers but especially regular users. Have you ever submitted an article to Digg and had it flat-line only to be resubmitted by a Power User and reach the front page days or even just hours later? 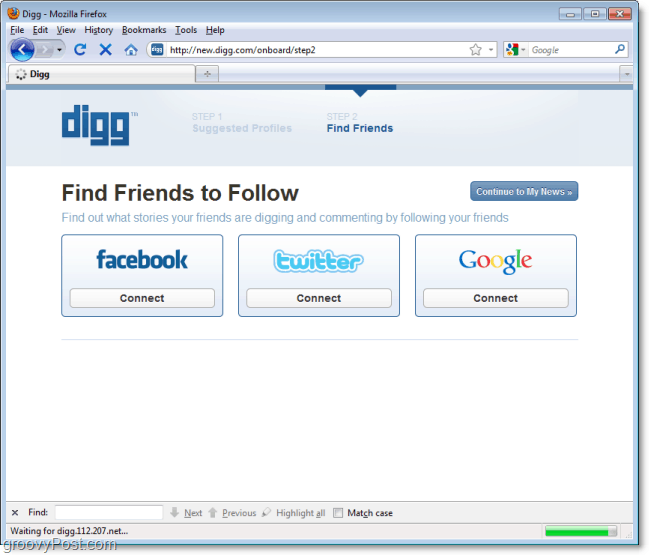 Digg Power Users have been a long-term problem for which Digg is often criticized. The New Digg is an attempt to focus on regular users and give everyone a fair chance of getting their content front page. The New Digg is currently in Alpha Testing, but there’s a chance if you have an older Digg account that you already have access. 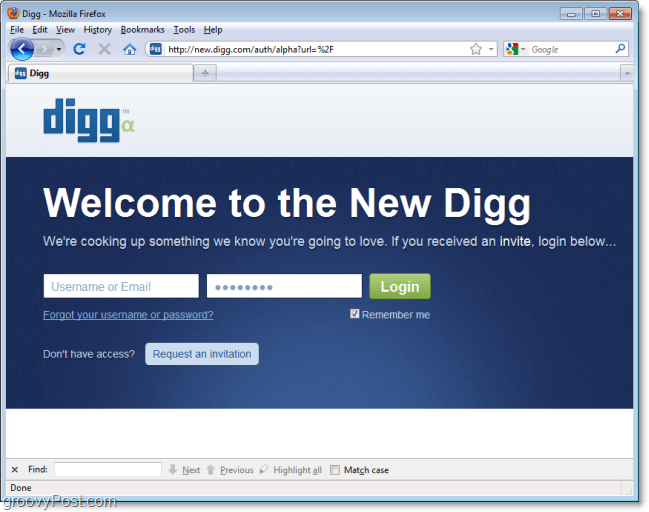 Either way, you can visit new.digg.com and check it out or request an invite which for me resulted in an instant invitation email. Right from the get-go the new Digg introduces their biggest change. Your very own personalized “My News.” They offer a list of suggested people to follow, but my only issue would be that if you’re joining Digg to follow the Wall Street Journal and Engadget, why not just use the light-weight Google Reader and follow their RSS feed? In fact, the new Digg feels like a combination of Twitter, StumbleUpon, and Google Reader with maybe even a few Facebook-esq features thrown into the mix. 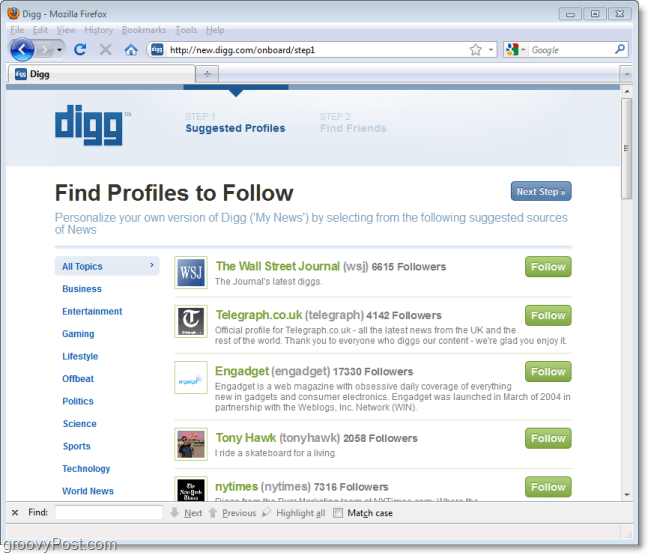 In the second step, the new Digg invites you to find friends that might use Digg or any of their integrated partners. As you might have guessed, the heavy hitters – Facebook, Twitter, and Google – have shown up to the party and are getting in on all the Digg action they can. Ready for the biggest change? Here it is; “My News” – Yup that was it. 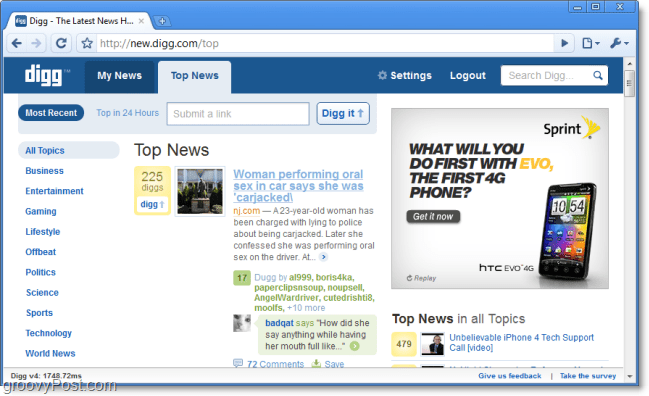 By default when you log in to Digg you’ll see the “My News” page in its full glory. This new part of Digg is where you’ll see all of the most popular articles submitted to the site by only people you follow. No Power Users. My News is where you get to decide what DIGG news interests you. In a sense, it’s your personally tailored news section. This customization is where Digg has become A LOT like Twitter. However, instead of creating news yourself, you’re almost like a publisher??? Yeah, this one is hard to wrap your head around. Of course, if you want to see what’s most popular on Digg as a whole, you can still check out the good ole’ Top News tab where it will display Digg news as you know it now. The Top News section is more or less the same as it is now but has a cleaner look. 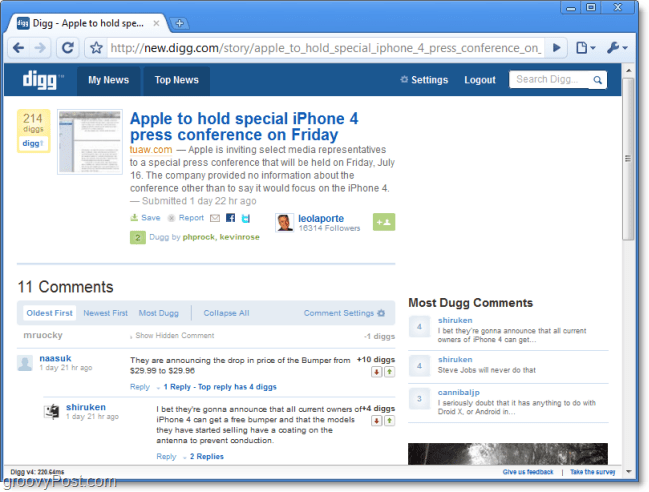 It now displays which of your friends have Dugg each article. The interface is different as well, and it’s pushed over to the left rather than up above. I think this is a reflection of the new trend manufacturers picked up on – to make nothing but Widescreen monitors. But if you think My News was similar to Twitter, just check out these colors and layout. Does it remind you of any particular book of faces? 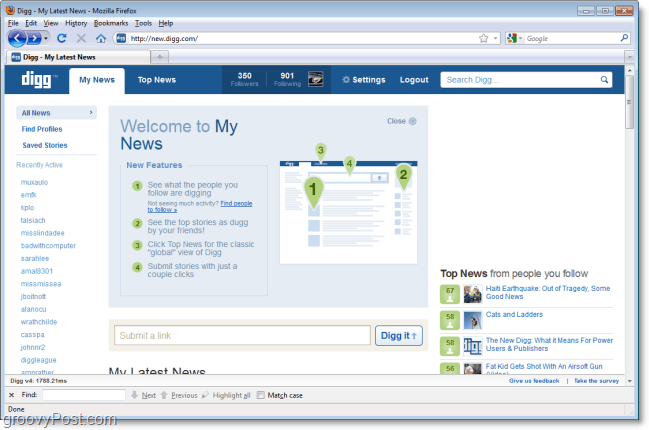 Perhaps the new design will be friendly enough towards Facebook users that more will begin to use Digg. Personally, I think it still needs a lot of work. 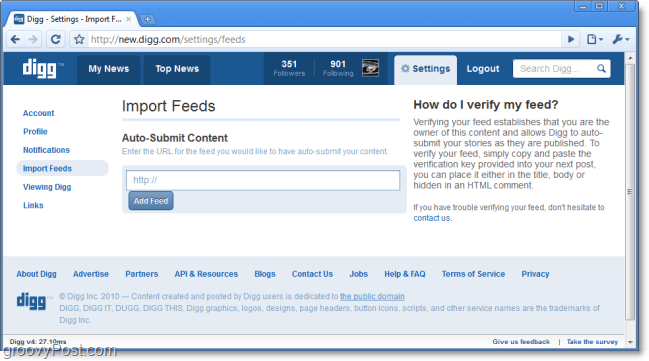 Another HUGE change is the ability to automatically submit content that you own straight to Digg via RSS feed. This feature means websites like NY Times, Telgraph.co.uk, CNN, or groovyPost can publish their content to Digg without requiring a user to submit it. Of course, the sad part about this is that most of the articles you’ll find on the net are already submitted to Digg, so you’ll only be able to thumbs up them. Then again, with the old Digg, there was no point in submitting unless you were a Power User in the first place. Submitted articles look almost the same as they always have, but it’s cleaned up a little. For most Digg readers the comment system is the biggest reason they keep on coming back to Digg. In fact, it has been so successful that YouTube and many other sites have copied Digg by incorporating a Thumbs Up or Thumbs Down feature for comments. I especially like that you can sort comments by “Most Dugg” and adjust account settings to customize your comment experience. Under the Settings area there are also some new options for publishers to automatically DIGG new articles they post from an RSS feed, but so far our experience with this has been unstable. I expect things to firm up as they kick this out of beta but overall, there you have it. The new DIGG! It’s a bold and risky move by Digg. However, I think it’s a good move by them to stay relevant in the wake of Google, Facebook, and Twitter. If you want to try it out head on over to http://new.digg.com and see if you have an invite. Need an invite? You can request one at the same place!